The IoT is a key enabling technology for application domains with very high societal relevance and impact, including smart cities, smart cars, smart health, smart factories, and smart buildings. All these applications are only feasible if the underlying Internet of Things doesn’t fail, as failures may lead to disastrous real-world impact. 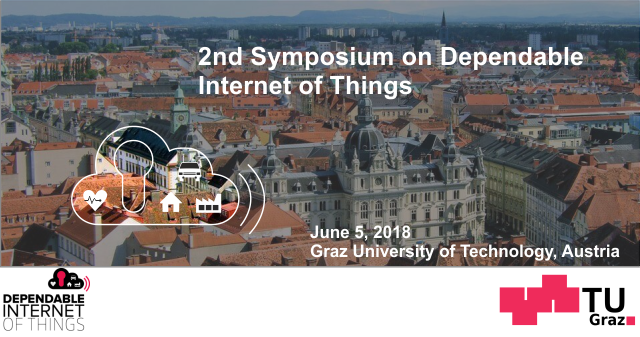 The "Symposium on Dependable Internet of Things" aims at discussing concepts, methods, and tools to predict, guarantee, and ultimately raise the level of dependability of the IoT, where dependability summarizes all attributes of a system that allow a user to put trust into and rely on the system, to systematically construct a dependable IoT that is resilient against failures due to adverse environments. Adverse environments pose the IoT with a range of physical and man-made treats, including harsh environmental conditions (for example, unpredictable wireless signal propagation and strong interference from other wireless transmitters), physical and remote attacks, and the inherent complexity of a system of systems. In case of questions, please send an e-mail to baunach(at)tugraz.at or call +43316876412.